The 43rd Prom featuring the Royal Philharmonic Orchestra conducted by Andrew Litton was without doubt one of the most generous of the season, running well over three hours with two twenty minute intervals. A copious, but at times also rather heavy meal of 20th-century music, with two symphonies, a piano concerto, and two shorter orchestral pieces. 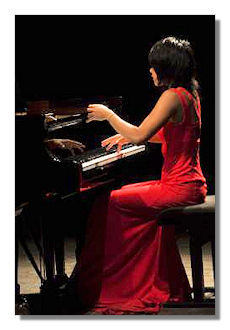 The concert also included the Proms debut of the acclaimed 24-year old Chinese pianist Yuja Wang. The American Litton is currently music director of Norway's Bergen Philharmonic Orchestra. Previously he was principal conductor of the Bournemouth Symphony (1988-1994) and music director of the Dallas Symphony (1994-2006). This eclectic program was to some extent centered around the imposing figure of Russian-American conductor Serge Koussevitzky (1874-1951), for twenty-five years music director of the Boston Symphony and an ardent champion of contemporary music. Koussevitzky premièred both symphonies heard here: Arnold Bax's Second (in 1929) and Sergei Prokofiev's Fourth (in 1930), which he also commissioned – although Litton performed Prokofiev's 1947 revision (the Op. 112) with which Koussevitzky had nothing to do. Incidentally, neither of these two works ever acquired much popularity in the concert hall. The revised Prokofiev's Fourth had been performed just once at the Proms, while Bax's Second made its Proms debut. The Fanfare for the Common Man from Aaron Copland acted as a brief but muscular curtain-raiser and set the tone of much of the evening. Arnold Bax's 2nd Symphony is an autobiographical work, composed between 1924 and 1926, a period when Bax was by his own admission "going through absolute hell". It reflects as much the turbulent affair of the composer with the pianist Harriet Cohen, as on a higher level his own pessimistic world-view. The result is a rather unwieldy piece that sort of whacks you with a sledgehammer in the face without telling you exactly why. Intriguing in places, the symphony fails to convince as a whole. In any case, Andrew Litton proved the best possible guide through the highs and lows of Bax's inspiration. Intensely focused, he revealed the often unusual textural complexity with clarity and almost made us forget the episodic nature of much of the writing in the outer movements. The slow movement, with its deceitful serene mood, emphasized the Royal Philharmonic Orchestra's rich sonority even more. The presence of celesta and organ, all beautifully blended within in the orchestral mass, added extra color. The second part opened with a ravishing performance of Samuel Barber's ubiquitous Adagio for Strings. Noble instead of lachrymose, Litton and the splendid Royal Philharmonic Orchestra strings made the strongest case for this piece and it was a much appreciated moment of repose within the concert. On the other hand, Yuja Wang's performance was incomplete. She seems to have made a specialty out of performing some of the most daunting pieces in the repertory, like the Liszt Sonata, Prokofiev's 2nd Piano concerto, or indeed Bartók's Second. Yet choosing the latter for a debut in this house was definitely not a good idea. Petite and slight (and one can only wonder at how her small hands cope with it all), Wang looks a pretty straightforward artist, who seems to know where she is going. There is no doubt she is a fantastic talent, equipped with a tremendous technique and temperament to boast, but it takes more to tame this Bartók. She was score reading and although it was clear she knows the piece inside out by now, for the most part she only skimmed the surface of it. There was plenty of brilliance to admire of course, yet structurally it all remained rather vague. For most of the time Wang was not only battling against Bartók's rhythmical and often mechanical themes, but also against the orchestra. In the first movement she got frequently drowned by the brass and percussion and even when she was playing solo her dynamic range remained rather limited. No matter how hard she seemed to pound the keys, the sound she produced was too small-scaled for the Royal Albert Hall. The final Allegro molto sounded more balanced and sparkled with plenty of color but overall one couldn't escape the impression that a different work would have been a better choice for this venue. After the second interval came Prokofiev's 4th Symphony in its post-war version. As his 3rd Symphony, the Fourth (published as Op. 47) generously recycles music from a stage work, this time the Sergei Diaghilev ballet The Prodigal Son. The première by Koussevitzky in 1930 met however with little success and withheld Prokofiev for fourteen years from giving another shot at a symphony. His revision (Op. 112) in 1947, now back in the Soviet Union, included a considerable development of the thematic material in all four movements and of the orchestration, profoundly changing the work's character, all in a none too successful attempt to emulate the impact generated by the vast frescoes of the recently completed Fifth and Sixth, as well as to conform to Soviet realism. To no matter, since in 1948 his music was found guilty of "formalism" by the fearful Zhdanov and the Union of Soviet composers and the 4th Symphony was never performed in Russia during Prokofiev's lifetime. Again, Litton turned out to be the most convincing advocate of this flawed work, performing it as if it was the greatest symphony ever. Conducting from memory, he vigorously stitched the patches together, leading the always responsive Royal Philharmonic Orchestra towards the towering, triumphant climax in the finale, and adroitly avoiding most of the pitfalls of all too excessive bombast in the outer movements. The well-judged orchestral balance gave Prokofiev's characteristic sonorities their full due and while there was plenty of excitement, as in the use of the wood blocks (reminding us of the clock in his slightly anterior ballet Cinderella), the dark brass and brilliant percussion, the sound never became harsh. The transparency of the orchestral playing was a continuous delight, especially in the Andante tranquillo, which boasts some truly inspired orchestration with beautiful woodwinds and was most agreeably phrased by Litton. The superb brass section which had been working hard all evening got its final moment of glory in the last bars of the symphony, duly bringing the house down. Undoubtedly an uneven concert, mainly due to the Yuja Wang's less than convincing debut, but on the other hand also highlighting the Royal Philharmonic Orchestra as a magnificent formation and Andrew Litton as a foremost conductor.